Friday matches winning score points: 340,377,235,434,329,178,415,430,284,371,390. Saturday matches winning score points: 371,390,174. Quarter Final Results: Winning 2 out of 3 (match requirements): 374, 335. Semi-Final Results: Winning 1 out 3: 295(L) 340(w) 236(L). Finals Winner goes on to World Competition in Detroit, Mi. 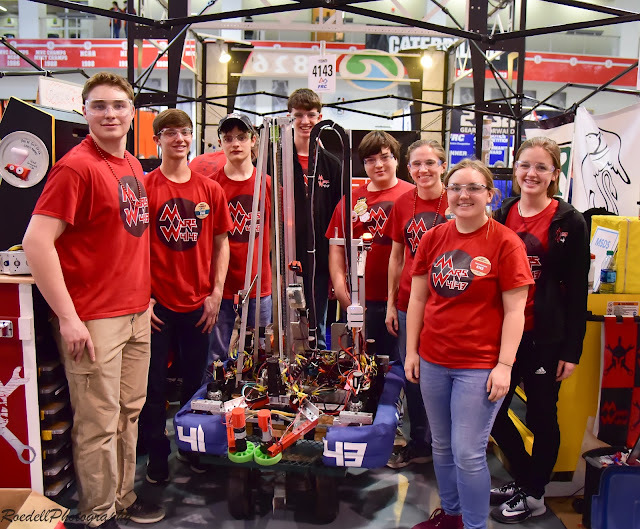 * FIRST ROBOTICS COMPETITION teams compete with 120 pound robots of their own design. Teams consist of a three team alliance. Winning goals: Owning the Scale or their Switch. Playing power ups with alliances by exchanging power cubes. Climbing the scale tower. 2015 Won Regionals - Breaking World High School Scoring Record with 506 points. 2017 Won Regionals - Winning Finals - with a score 332 to 305. Record: 15 wins - 1 lose. Year consisted of building a ' Revolving Shooter ' style Robot. 2018 - Competition involving building robots to fit the Scale and Switch competition technology. Robots are required to lift, place and carry boxes. the robot, finished or not finished, is wrapped and sealed not allowing any further mods. During St. Louis Regional's in Quarter finals, robot (named: "Waka Blocka" after the sound it made while running) broke a zip-tie resulting in a lose. A redesign of arms and motor followed. Waka Blocka has an estimated speed of 18 feet/sec. Interview with Captain Team Driver Ryan Meyer and C++ Coding programmer Cole Hunt. "Our strategy for this competition today is to make great alliances, control the 'Scale' and exchange Force Boxes for 30 points with our alliances. 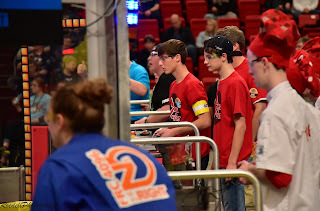 Note: Alliances were made with Peoria Robot Casserole, team members Chris Gerth, Parker Collins, Dallas Goodwin, Braden Gersich. CIA Robotic Big Furious George, team members Kayi Pepple, Regan Swain, Trenton Gramlish, Maddy Glueck. Students: Aubrey Wyman, Jacob Schertz, Ryleigh Hickman, Danielle Dominy, Joey Pfister, Joseph Koenig. Students: Sam Landau, Joel Tobben, Ben Poling, Brody Webster, Andrew Kamp. Mentors: Ray Tealbey, Nathan Kaufman, Sheridan Ray, Justin Pfister, Neil Hess. Students: Derek Ayers, Isaac Adams, Dillon Wernsman, Jaycob Foster, Keegan Hartnett, Clay Barlow, Charlotte Wilkes, Ryan Meyer, Kyle Barker, Evan Charlier, Ryan Shapland, Grant Hammer. Students: Chris Hahn, Crew Matthews, Cole Hunt, Merrick Watkins, Ann Doyle. Students: Katie Meyer, Logan Schmidt, Madilyn Ayers, Austin Kasap, Brooke Barlow, Hunter Kasap.